The Imperia Pasta Factory Gift Set has all the necessary tools and gadgets to make a variety of fresh homemade pasta including tagliatelle, lasagne or ravioli with your own homemade fillings. Pasta can be made in six different thicknesses. 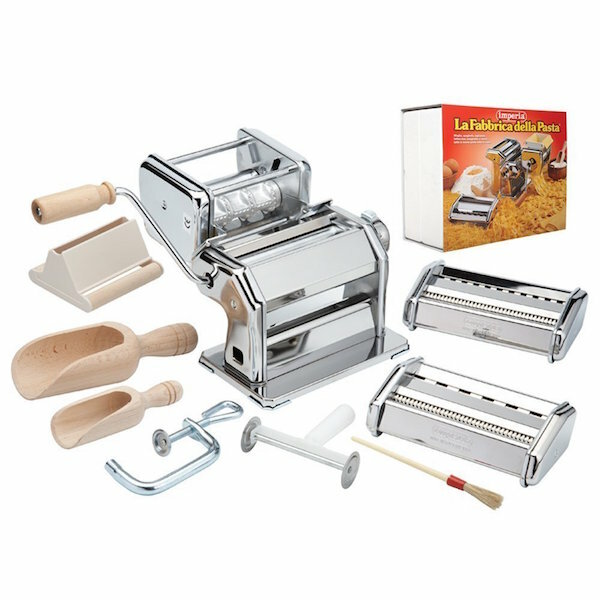 The 9-piece set includes a durable pasta machine in heavy duty chrome-plated steel that is easy-to-use with a detachable, rotating handle and a secure clamp to securely fix the machine to work surfaces. Attachment cutters fit onto the pasta machine to make ravioli and spaghetti. Additional tools include a pasta brush, pasta roller, and wooden scoops for essentials like flour. Fresh homemade pasta will provide satisfaction for the whole family with fresh ingredients. An ideal gift for a cooking enthusiast.